Avid birders (bird watchers) keep a life-list to track the number of different species of birds they have spotted. David Howard, from Arlington, Virginia, has his own life list. Dave is a fisherman and keeps track of all the various species of fish he’s caught. His fish list is a part of the strategy Dave uses to plan how to use his vacation time. First, he looks for airfare bargains. Next, he checks what sort of fish and fishing opportunities are available near discount destinations. The only thing better for Dave than planning a trip to catch something new, is one where two or even three new species can be caught. Dave with his new "listings." Top is his steelhead, brown trout in the middle and the coho, closest to the camera. That’s how we got together. My website has a fishing calendar which shows what species of fish are most apt to be targeted and caught as the season progresses. 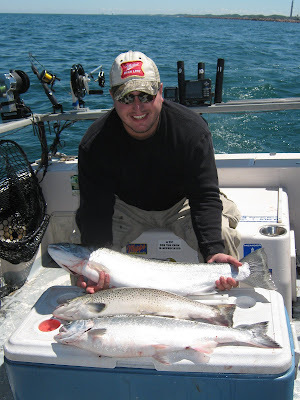 During the mid-summer season, steelhead, lake trout and both king and coho salmon are common catches. So we set a date and crossed our fingers for the chance to hook several species on Dave’s day. The weather man did us no favors. Northwest winds were blowing 2 to 4 foot waves making it impossible to head to the offshore areas. However, Indiana’s Skamania steelhead were biting close to shore so by staying in shallow water he had an excellent chance to add at least one species to his list–if he could land one. The first fish jumped and threw the hook before Dave could pull the rod out of the holder. The second fish pulled the same stunt on our next pass. The third time, however, had a better outcome and a beautiful 14-pounder was eventually coaxed to the boat. Success! But there’s more. Mid-morning Dave added a brown trout to his life list, – and a dandy, at that, weighing nearly 10 pounds. Just before time to quit, the waves calmed enough to allow making a troll a half-mile or so offshore to see if the water in the depths was cool enough for any salmon to be there. I didn’t need the temperature probe to show the results, a coho almost as big as Dave’s brown latched a deep running lure and his multi-species outing was a fulfilled. Carl and Dennis work for the Norfolk and Southern Railroad servicing the "Executive Train." It’s powered by an immaculate 1952 locomotive with a dining car, meeting room car and places for the execs to live when riding the rails. The train heads for some city, Carl and Dennis make sure it’s polished, shiny and waiting so when the VIPs show-up, they have their meeting in style. The train was ready for Monday’s meeting late on Saturday afternoon. The two Pennsylvania residents, looking for a bit of "south-Chicago" excitement found themselves at the Horseshoe Casino at the Hammond Marina and a short time they’d parlayed their "investments" into a pile of cash. Looking out over the calm waters of Lake Michigan, they decided to add a day of salmon fishing–courtesy of Jack Binion’s losses–and found my website. 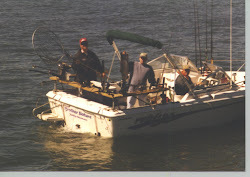 We met at the East Chicago Marina at dawn and after a short trip north to the Illinois border, we were into the fish. One after another came at a steady pace. All cohos–summer fat, sassy, spitting-up alewives. 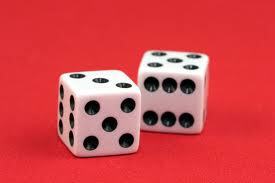 Can gambler’s luck turn into fisherman’s luck? For these guys, the answer is yes. When someone asks me what’s my favorite species of salmon or trout to catch from Lake Michigan, it’s a tough question. SKAMMIES THAT DIDN'T GET AWAY! best coho salmon fishing in the world. But for a period each summer, I like Indiana’s "summer-run" Skamania strain steelhead better than all of them. Skamanias routinely grow larger, fight harder, jump higher and break more tackle and hearts than all the other fish put together. Take yesterday, for example. Captain Doug Iliff asked me on board his boat along with 3 other captains from the East Chicago marina for a day of fun fishing. Rumor had it, the Skamanias–Skammies–were "in" at Portage, at the extreme southern tip of Lake Michigan. I mean extreme! Not only were we fishing at the exact southern point of the 300 mile long lake, we were only in 10 to 20 feet of water most of the day, close enough the beach-goers could cheer us (or our fish) as we gave battle. In the end, we boated 5 of the fish. The line broke seconds after a strike on another, they bent the hooks open on the lures we were using twice and another 7 or 8 of the silver torpedoes pulled a variety of Houdini-like tricks of their own making to offer us moments of thrills and disappointments. All in all–a successful day in Skammy-Town. Expect the Skamania steelhead to continue offering fun and excitement at the south tip of the lake for another month or more. Call me! I’ll look forward to the trip as much as you! Sixty years ago Mrs. Cronin gave birth to a set of twin boys in New Jersey . Sixty years later, one of the twins, John, now living in Florida called me to set up a special birthday party for Jim, his twin, and himself. A fishing trip on the Brother Nature. They couldn’t have picked a more spectacular day. The sun was an orange ball as we motored up to full cruising speed, leaving the Portage shoreline behind us. At 30 miles per hour, the ride out to deeper, cooler water was short–about 15 minutes or so and the 15 minute rule seemed about right for the day. John told stories of his bass fishing passions on Florida lakes. Jim reminded him of other days fishing they’d spent together. I reminded them, just about every 15 minutes that we were out there to catch some fish and they’d best handle the one currently bending down one of the rods. Salmon and lake trout bit steadily. The lake remained glass smooth all morning. Some of the fish escaped (the big ones we agreed–the big ones always get away–and laughed.) Some of the fish went home, destined for the backyard grill at Jim’s Portage, Indiana home. Happy Birthday! In a recent column I wrote for Michigan Outdoor News I told about attending a Great Lakes fish-boil while on a trip to Door County, Wisconsin and how the original GLFBs featured lake trout, not the whitefish used in modern day boils. So on our way home from the trip I blogged about below we decided to serve some of the trout pictured in our own fish boil. The real-deal fish boil was our goal. No stove-top boils, no whimpy flames for us. It was to be outdoors, in a big pot over a big fire. Peggy stopped by the grocery store for some red potatoes and some potato-sized onions and we were set–almost. I built a good sized fire out of dried oak and mulberry wood. Once it was blazing, I set a raised grill over the flames and positioned a backyard fish-cooker fry-pot on the grill, filled about 3/4s with water. When the water started to boil, we were ½ hour from dinner. A pound of salt (just a guess) went into the pot with a dozen (3 each) red potatoes and the timer set for 10 minutes. When the timer rang, the onions were added (2 each) and the timer reset to 10 minutes. When the timer beeped, the lake trou t chunks were added for the final 10 minutes. The lakers were fileted, skin removed, fat and lateral line trimmed and de-pin-boned. Traditionally, liquified bacon grease is added to the fire to make it flare at the end of the cooking time. I had no bacon grease or kerosene, so I improvised. Three-quarters cup of vegetable oil went into a container along with a quarter cup of lawnmower gas. This isn’t something I advise anyone to duplicate–but it worked! From a distance I doused the fire with my concoction, the fire flared up, the water went from a medium boil to a raging boil in a few seconds, cascading over the rim of the pot spilling ash and lake trout oils into the fire. THE BOIL OVER IS THE TRADITIONAL (AND SPECTACULAR) END TO A GREAT LAKES FISH BOIL! Served with melted butter over everything, it was terrific! Much better than the whitefish boils I’d eaten previously and much more fun than a traditional backyard fish fry! Try it for yourself–but be safe. Tom Lowrey (Wisconsin) with his Uncle Bill from central Indiana held a family reunion and Laker-Fishing-Fest on the Brother Nature recently! I’ll admit to being a lake trout lover. I agree, pound for pound they don’t fight like a king salmon. I agree, plate for plate they don’t taste as good as Great Lakes salmon in some recipes, either. But they are fun to catch and there are many recipes for lakers which will have you wanting seconds. So when the laker bite is on, I relish the opportunity to fish for and catch the fish which were once the top predator in the Great Lakes. When I was a youngster I relished reading outdoor magazine accounts of jet-set anglers traveling to the ends of the Earth. These guys fished for huge fish in exotic locales, and those guys heading to the far north in search of sag-bellied lake trout were as much my hero as Justin Bieber is to today’s "citified" youths. I never knew lake trout were once endemic to Lake Michigan, a short drive from home. The commercial fishermen and lampreys had wiped them out. Now they are back, they are big and when they are available, I love fishing for them. I’ve never come back to shore with a group of unhappy anglers who have had a been through a laker-smackdown.